In about 1900 Edward and Sarah Ann Shillaker moved from Sleaford to Hough on the Hill, where he became a butcher. They had 8 children, including Bertie (born Hough 1893) and Charles Edward (born Hough 1895). By 1914 they’d moved to Caythorpe. 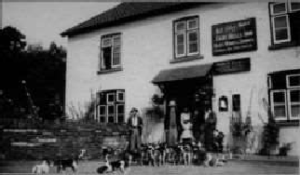 Meanwhile, in the first decade of the 20th century, William Clayton and Rose Clayton moved from Thurlby to take over Carlton Ashes Farm (near Hough). They had 6 children, including Florence (born Thurlby 1892) and Gladys (born Thurlby 1896). In 1917 Florence had a son, Philip John Clayton. Charles Edward (known as Edward) Shillaker joined the King’s Royal Rifle Corps in May 1916. He was a private in 8th Battalion, serving in France from July 1916. Exactly a year after enlistment he was wounded in the left thigh and sent to a military hospital in Edinburgh. Bertie Shillaker was a railway plate-layer. He volunteered for the Royal Engineers In Nov 1915 and was called up in June 1916. He was 23 and 5ft 4” tall. He became a ganger/platelayer with a RE Railway Operating Division, serving in the Middle East from October 1916. He was promoted to acting sergeant but contracted malaria and was in hospital several times in his last year there. In October 1919 he returned from Alexandria on SS Teutonic (a White Star liner converted to a troopship) and was discharged. His application for a disability pension (due to malaria) was refused. In Feb 1919 (Charles) Edward Shillaker married Gladys Clayton. Their only child, Winifred May, was born later that year. In October 1941 Winifred married George Burrows of Caythorpe Heath (who was in the RAF) but Winifred died in Grantham Hospital at the end of the year (age 22) and was buried at Caythorpe on 1st Jan 1942. Edward became a poultry farmer and survived until 1975; Gladys died in 1982. In June 1922 Bertie Shillaker married Florence Clayton. They had a son William Edward Shillaker (born 6 July 1925). Philip Clayton was thus his half-brother. They later took over the Eight Bells Inn in Caythorpe (corner of Chapel Lane and High St). Florence died in 1950, Bertie in 1957; they had no other children. Philip Clayton was the captain of the Caythorpe Cricket Team and a bellringer at the church. He enlisted in the Army shortly after the outbreak of WW2 and served abroad for 4½ years with the Royal Army Service Corps. 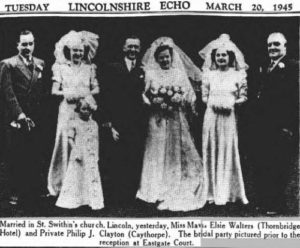 Soon after returning to England married Mavis Elsie Walters in Lincoln. Her parents ran the Thornbridge Hotel (the site is now Lincoln bus station). Philip was de-mobbed in April 1945 and they had a son, Ronald, early the next year. But Philip had been ill and spent some time in Lincoln Hospital. It was hoped that he’d recover but he had a relapse and died in Scunthorpe Memorial Hospital on 1 July 1946. He was buried at Caythorpe. Philip’s half-brother William Shillaker became an apprentice butcher. In 1943 (aged 18) he joined the Royal Navy. He qualified as an air fitter but in December 1944 he was serving as an ordinary seaman on a destroyer, HMS Cassandra. In the early hours of 11th December 1944 HMS Cassandra was in the Barents Sea, escorting a homeward-bound convoy from Russia, when it was struck by a torpedo from U-365. The bows and forward gun were blown off and 62 men were killed. William Shillaker was one of missing, presumed killed. The U-boat was sunk by a Swordfish aircraft from HMS Campania 2 days later. Despite the damage and near gale force conditions, HMS Cassandra was saved and towed back to Russia for repairs.